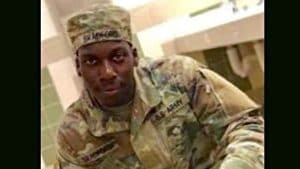 After the Alabama Attorney General failed to seek criminal charges against the officer who killed Emantic “EJ” Bradford Jr. in a case of mistaken identity at an Alabama mall, protesters filled the streets of the city furious at the outcome, AL.com reports. On Tuesday, protesters burned two American flags outside of the city hall in Hoover, Ala.
Attorney General Steve Marshall cleared the cop who shot Bradford at the Riverchase Galleria in Hoover on Thanksgiving night while responding to reports of gunfire at the location. The officer assumed Bradford was an active shooter. His family says he had a license to carry a concealed weapon. They also said he is a veteran, but a U.S. Army spokesperson told the Hoover Sun in November that he enlisted in 2017, but was “administratively separated” before completing his training. Bradford’s family members were also on hand and declared that they would continue to protest Marshall’s decision not to hold the cop accountable for Bradford’s death. “He did not deserve what you did to him. You shoot my first born son three times, three kill shots and you call this justice. How dare you. If this happened to your child, would you still call it justice? Because I don’t see any justice in this,” said Bradford’s mother, April Pipkins. Bradford’s mom, also spoke with Sybrina Fulton, the mother of Trayvon Martin, over the phone during the protests. “It won’t get any easier,” Fulton told the grieving mother. Organizer Carlos Chaverst spray painted “Black lives don’t matter” on two American flags, then set them on fire. Protesters chanted “no justice, no peace” as the flames from the flag ensued. Hoover police officers doused the flames with water. In the Attorney General’s report, which does not name the officer, Marshall reportedly states that the officer “reasonably” exercised his official duties in a five-second encounter since the officer was responding to gunfire. Marshall’s report further supports the idea that even though the officer’s mistake ended the life of a 21-year old Black man, that does not mean the officer acted criminally. Attorney General Marshall’s report also states that in response to the initial shooting, the first officer fired his gun four times; three of the bullets pierced Bradford Jr. in the neck and lower back. The fourth bullet hit a nearby pillar. The investigation concluded that Bradford was carrying a gun but never fired it. Marshall took over the case from the local district attorney last year. Cynthia Bradford, Bradford’s stepmother, thanked the group for their support. “We want to thank y’all protesters so much. You have our heart and our consent to go on and do what you’ve got to do,” she said. Protests were set to continue on Wednesday.